Beyond Furnaces: What's New in Heating? People expect to use a furnace or boiler in the winter to stay warm. But, there is plenty of room in the world of HVAC technology for newcomers. There are many innovative methods for heating that go beyond furnaces and boilers. 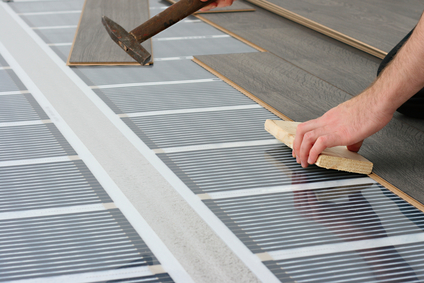 Some, such as radiant floor heating and solar heating, can be used in conjunction with another heating system. Others, including geothermal heating systems, may replace a furnace or boiler entirely. A. Borrelli Mechanical strives to provide the ideal products and services for our clients, no matter their heating needs. One major problem in keeping rooms adequately warm is heat loss. Heat loss describes the more general process of heat transfer, wherein heated air moves from one area to another. In the colder months, heat passes through the walls to the outside. Insulation is designed to minimize heat loss and improve overall heating efficiency. But, radiant floor heating is another consideration to help reduce heat loss and keep the home warmer. Tubes and plates are placed under the floor and behind walls. Radiant floor heating systems rely on infrared energy to heat those plates and tubes, sending heat throughout the room. Many homeowners use radiant floor heating in conjunction with a forced-air furnace, to provide more comprehensive temperature control. We specialize in the design and installation of geothermal heating systems. With geothermal heating, your home collects the earth’s natural warmth for use as energy. Underground, the earth keeps a constant temperature. Pipes are installed and filled with fluid to collect the heat. Then, the trained, qualified and insured technicians of A. Borrelli HVAC use a heat exchanger to convert the heated fluid to air and send it throughout the building. Because geothermal heating is designed to work with an existing ductwork system, retrofitting a home or business to accommodate geothermal heating is actually fairly straightforward. We install geothermal heating in both residential and commercial buildings. There are two types of solar heating–passive and active. Passive solar heating requires a solid plan in construction, to build several south-facing windows and install thermal mass surfaces. Thermal mass surfaces, such as tile or water, collect and store the heat. However, most consumers are accustomed to active solar heating, which involves solar panels, heat pumps and exchangers, as well as the ability to control how the energy is distributed throughout the home. Active solar heating relies on electricity to transfer the heat from the collection plates, and then to power the heat pump and heat exchanger to send heated air to the various rooms. Furnaces and boilers are the mainstays of heating for home or business. However, consumers should also consider new options for heating, which may improve existing efficiency and save money. At A. Borrelli Residential & Commercial HVAC Services, we provide professional installation and service for conventional and innovative heating systems, from furnaces to radiant floor and geothermal heating. We have served New York City, Westchester, Putnam and Dutchess counties since 1981.